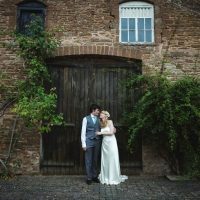 With a rich history reaching back 1089, How Caple Court provides a gorgeous venue for both indoor and outdoor weddings. Set in an area of outstanding natural beauty, it boasts stunning views of the River Wye, and glorious Herefordshire countryside. To the south stands the 13th Century Church of St Andrew, which provides the opportunity for traditional marriage ceremonies. Built on Norman foundations, this handsome church features inspiring stained glass windows, a Norman font and a sixteenth-century diptych. 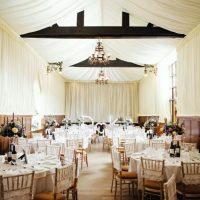 Accommodating up to 120 seated guests or 200 evening guests the Concert Barn offers a romantic setting for your celebration. The charming oak paneled barn features a vaulted ceiling, traditional oak beams and underfloor heating. Lit with twinkling fairy lights and grand chandeliers, this stunning room also possesses a stage for your chosen entertainment and minstrel’s gallery. 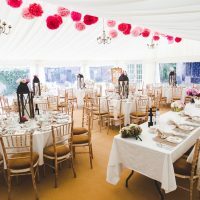 If you are planning a huge celebration the adjoining marquee caters for up to 120 seated guests or 200 evening guests. Neutrally decorated with ivory liners and intricate chandeliers, its provides a stunning backdrop that is easy customised to your chosen scheme. With sensational views over the courtyard, it benefits from extra outside seating throughout the warmer months. This makes it an idyllic location for long romantic summer evenings. 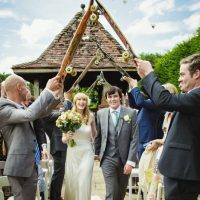 If you are more partial to an outdoor ceremony, How Caple Court sits within 11 acres of delightful gardens. Stroll around the formal terraces, take in the tranquil views of the Forest of Dean and Welsh Mountains and enjoy picturesque photographs in the rambling rose garden. There is something to be discovered at each turn with impressive statues, peaceful pools and a truly lovely Italianate water garden in the surrounding woodland. 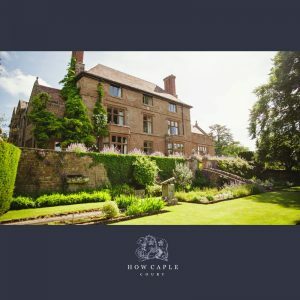 How Caple Court offers an in-house food and drinks service supported by two sensational caterers. Both focus on using fresh, seasonal and local produce to ensure your food tastes every bit as good as it looks. They offer a huge variety of menus to suit your budget and cater for most specialist dietary requirements.